Car Mechanics Magazine - in the 1960s! Homepage. This page: From the days when drivers looked after their own cars, and garages were avoided if at all possible. Forget magazines promoting glistening dealerships, and shiny new-car roadtests, what the DIYer home-motorist would be buying back in the days of string-back gloves and the mini-skirt (not usually at the same time..) would be Car Mechanics, a magazine that helped the hands-on owner/driver look after his or her own car. These were the plucky owners that would do virtually anything to avoid handing over hard-earned pennies and shillings to the local service station. I'd recommend anyone who enjoys spending their weekends lying beneath a 'classic' today, with mud in their eyes and old brake fluid running down their sleeves, to hunt out some old copies of this mag, as it can be packed with really useful info, written when today's collectable cars were just cheap old runarounds. It must say something for the magazine, that it is still around today (here is their current website), providing much the same type of info as it was doing back in February 1967, when the magazine shown here was published. 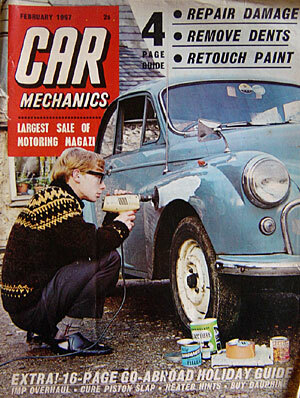 On the cover of the Feb '67 issue we have an earnest looking youth* setting to work, fixing a dent that his beloved Morris 1000 had picked up along the way. The tax disc shows January '67, and also in the windscreen (but not visible unless you look closely at the original) is one of those stickers, that reminded the driver of all the current roadsigns and their meanings. The chap with the Minor is obviously keen on home car improvements - note the telescopic radio aerial, and flashing indicator fitted to the top of the front wing. These early Minors (probably 1961ish) still had semaphore indicators, so it was quite common to either fit the indicator units from later Minors, or else nail on some after-market flashers, as shown here. "Just stumbled into Old Classic Car whilst doing some research. Curiosity led me to 'magazines' and then to 'Car Mechanics' of Jan 1967. I'm the 'earnest looking youth' hard at work on the Morris Minor. The specs are real, and the 'wolly pully' was borrowed from my (then new!) wife. I joined Car Mechanics in 1966 and, because we only had a staff of three, spent several months as the new face on the cover. I've still got every copy. Motor mags were few in those days, but consequently circulation figures were massive. Both CM and Practical Motorist (the opposition) sold over 200,000 copies a month. Most publications nowadays struggle to reach one tenth of that figure. Car Mechanics was part of the long-gone Mercury House group. After two years on CM I moved one office down the room to Popular Motoring, and then - in 1968 - crossed the corridor to help start Hot Car. Laid out on the floor are all the essential DIYer products for that long-lasting repair - Bondaglass glass fibre matting, Bondapaste ready mixed filler, glass paper, and a tin of Bondaprimer. The photo was taken just as the keen home-mechanic was about to attack the most recent layer of filler, with a sanding disc fitted to his electric drill. Health & Safety nannies would today insist on our hero wearing a mask, and some eye protection instead of the spectacles he was wearing. The woolly pully would never be the same again. These magazines can be picked up for just 50p or so, at shows and car boot sales, and they are well worth a read. The old advertisements are a good reason on their own for hoarding an unhealthy number of ancient magazines, and Car Mechanics has plenty of ads to please. A flick through just this copy brings up long-forgotten promos for products such as Firestone Town & Country tyres, REDeX upper cylinder lubricant, Spitfire Jet Igniters (a replacement for the spark plug apparently), Bridgeport Tyre Valves (a full-page ad no less! ), Cords piston rings, Valvoline Tectyl rust preventative spray, Blue Peter retreads (remoulded tyres), the Weather-Beater car coat (a car coat "Sensation" no less), Eversure fillacans (great things these, a petrol tin with a built-in metal pouring spout), Cosycar interior heaters and loads more. But the main reason the 60s car driver bought Car Mechanics was for the handy maintenance information within its pages. Get past the 'comment' type articles from John Mills & Harry Loftus, and the letters page full of motorists waxing lyrical about their handiness with a spanner, and you get the meaty articles. In February you could curl up in front of an open fire, pipe in one hand, and CM in the other, and find out how to cure carburettor icing in a '59 Consul, and rectify an irritating backfire in a Wolseley 4/44. I hadn't realised that some waterpumps had a tiny drilling near the top, out of which excess grease would ooze should too much be pumped in during servicing - just one of the useful nuggets that flicking through an old car mag can turn up. There is a great news page, highlighting things that car owners could look forward to. There's an interesting mini-article, headed "'WARE THE Q-CARS!". This article talks about the joys of unmarked police cars ... "More and more camouflaged police cars are being used and it is reckoned that their numbers will increase during 1967, particularly for patrol work. The Metropolitan Police will be using Jaguars in place of the Wolseley 110 and other changes are being made throughout the country. One round-the-corner idea is being used on the M1 where the police are using very hot Cooper-Minis in civilian colours. The Minis are equipped with radar and, just recently, one of these ferocious little monsters booked a speedster at 110mph! These Q-Minis are betrayed by an aerial in the centre of the roof and they usually lurk in entrance roads to the M-way.". Top advice there! does anyone reading this remember being pulled by one of these Police Mini Coopers? Further into the magazine and there is the full article on fixing up the Minor shown on the cover. The lead photo this time is our jumper-wearing hero once again, this time applying paint to the repaired wing (again no breathing apparatus). All the shiny bits are masked up, and top coat is being applied. This article is one of a series of 'beat-the-squeeze' articles, aimed at motorists who had to work to a tight budget. Back then repairs were often of a more 'make do and mend' style than are done today, probably because today people can afford (or get finance..) to get things repaired properly, or simply don't tend to run cars for so long that serious rust ever becomes a problem. The article goes on for several pages, with photographs showing the step-by-step way to dig out the rusty bits, before mixing up the Bondaglass and applying the top layer(s) of filler, prior to final painting. While articles like this probably make restorers today wince in agony, in their day they really provided a useful service to owners who's priority was simply to keep their old crock going for another year. More handy info in this issue includes a piece on how to cure piston slap, improving the performance of the car hand-brake to keep the MOT man happy, knowing what to look for when checking over a Renault Dauphine, and a 16 page pull-out guide on taking your car abroad. The latter article begins with a great photo, showing an 1100 being followed into the hold of a Bristol Freighter by a BMC Farina saloon, the aircraft's front end open to receive its cargo. The service was operated by BUAF, or British United Air Ferries, and was an alternative to using a ferry when taking your car to France. If anyone has recollections of using these air ferry services, it'd be great to hear your experiences! Hillman Imp owners were sure to keep this copy as there was a handy article on overhauling their car's rear-mounted engine, and owners of sooped-up Minis need put up with warped discs no more, thanks to a piece by Paul Davies on how to fit new replacements. Driving in winter months need no longer be a chilly experience, thanks to some handy pointers on maintaining a car's heater system, and the best-selling 1100/1300 range was treated to a servicing guide. Probably my favourite piece in the entire mag is the Reader's Custom Cars double page spread. Featured are several once-standard cars, that have been at the receiving end of a keen DIYer, intent on loading up their car with every affordable accessory that they could lay their hands on. First up is a '59 A40 Farina, that has a dashboard that wouldn't look out of place coming under the control of James T. Kirk and crew, so comprehensively packed with dials, knobs and whistles. In fact KGM 207 belonged to a keen chap in Nairobi, and had 105,000 miles under its crossplies yet still looked in top notch order. The dash had every optional goodie screwed to it, with handy labels stuck above, created with those hand-held labelling things that clunked out a label, letter by letter, from a rotorary dial of letters and symbols. Below this A40 was another Mk1, this time a '61 model, shown on the right. Mr Stokes, who owned PBF 804, won 2 guineas for his efforts. 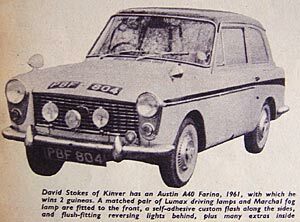 Among the updates he'd made to his car was a pair of Lumax driving lamps, and a central Marchal fog lamp for murky conditions. A stick-on side flash, not unlike those found on 50s A95s and such had also been stuck on, and a smart set of full-width wheel trims affixed. A VX4/90 also starred, as did a Mk2 Austin-Healey Sprite that belonged to a chap in the RAF. He partook in club rallies so had good reason to fit five extra lamps to the front of his tiny sportscar, and lots of goodies inside to aid the navigator when charging around his home lanes in Theddlethorpe. Perhaps the naffest looking car, sadly only had one photograph in the magazine. A tiny photo shows the interior of this car, a '61 Mini, which has a quilted dash and centre console, complemented by leopard-skin seat covers. The only mod of any use seems to be the remote gearlever extension. So there you have it, if owning a classic car to you means de-greasing old engine parts, and stripping down an old component rather than chucking it away to replace with new, then look out for copies of Car Mechanics magazine, and you'll probably learn far more than most of today's 'classic car' mags could ever get across.